Acts 27 - Shipwrecked in the storm of life. When I was an active duty member of the U.S. Coast Guard (I retired after 30 years of service), I participated in many rescues that involved a shipwreck. In some of the shipwrecks there was a loss of some or all of the lives onboard. In all of the shipwrecks there was a tremendous monetary loss in property. Take my word on this; a shipwreck is something that no one wants to go through. Did you know that the Apostle Paul was shipwrecked three times? That's right, three times! If you want to verify that, read 2Cor. 11:25. I imagine that a ship's captain in Paul's day would have looked at him and said “Oh no, not you, not on my boat! Let someone else take you to Rome.” Acts chapter 27 gives a detailed account of one of those shipwrecks. (1) And when it was decided that we should sail for Italy, they proceeded to deliver Paul and some other prisoners to a centurion of the Augustan cohort named Julius. (2) And embarking in an Adramyttian ship, which was about to sail to the regions along the coast of Asia, we put out to sea, accompanied by Aristarchus, a Macedonian of Thessalonica. (3) And the next day we put in at Sidon, and Julius treated Paul with consideration and allowed him to go to his friends and receive care. (4) And from there we put out to sea and sailed under the shelter of Cyprus because the winds were contrary. (5) And when we had sailed through the sea along the coast of Cilicia and Pamphylia, we landed at Myra in Lycia. These first five verses are a detailed explanation of where the ship journeyed on the first part of the voyage. Paul and some other political prisoners, who were headed for Rome, were put into the charge of a centurion named Julius. A cohort was a band of soldiers numbering four hundred and eighty (480) men. Typically, a cohort consisted of six centuries (eighty men per century). Julius was the commander of one of those centuries. Since Julius was part an Augustan cohort, he was probably working directly for Caesar. This would allow him to commandeer any vessel large enough to suit his needs and purposes. The ship started out from Caesarea (see map) and followed the coast northward to the port town of Sidon. When they left Sidon the skipper wanted to sail in a straight line past the island of Cypress to Myra. Unfortunately, the winds and waves were against them and they had to take the long route along the coast. The advantage in taking the long route was that they could use the island of Cypress to shield them from the weather. The winds and waves would be much calmer in the lee of the island. Although the trip would be much smoother, it would also be twice as long. (6) And there the centurion found an Alexandrian ship sailing for Italy, and he put us aboard it. (8) and with difficulty sailing past it we came to a certain place called Fair Havens, near which was the city of Lasea. In the port of Myra (see map) the centurion was able to find another boat preparing to sail for Italy. The boat was from Alexandria, Egypt, and was probably loaded with goods and grains from that country. This would be grain from the late Fall wheat harvest and would also be the last grain shipment to Italy until the late Spring harvest. I do not have any doubts that the owner of the ship was looking forward to a very profitable trip to Italy. The Centurion secured passage for himself and his prisoners and loaded everyone onboard. The weather had still not improved but the owner of the vessel raised his sails and they continued on their journey. Luke (the author of the book of ACTS) notes that the going was slow and difficult (which was probably an understatement) so they pulled into the town of Cnidus. Cnidus was a town on the southwest corner of Asia Minor with the island of Rhodes to the south and the island of Cos to the west. Ideally the ship would now sail straight west to Greece, but the weather would not allow this course of action. They were forced instead to sail southwest to the island of Crete. Expecting to find calmer waters underneath the isle of Crete, they found exactly the opposite. They sailed with difficulty against the wind and pulled into a small village on the western end of the island named Fair Havens. The weary sailors, soldiers, and prisoners were more than likely very relieved to finally have respite from the foul weather. The constant fighting of the sea, bailing the boat, and manhandling the sails takes a lot out of a person, not to mention that it is very difficult to sleep and eat in a heaving and pitching boat. I imagine they spent the first few days in town sound asleep. (11) But the centurion was more persuaded by the pilot and the captain of the ship, than by what was being said by Paul. 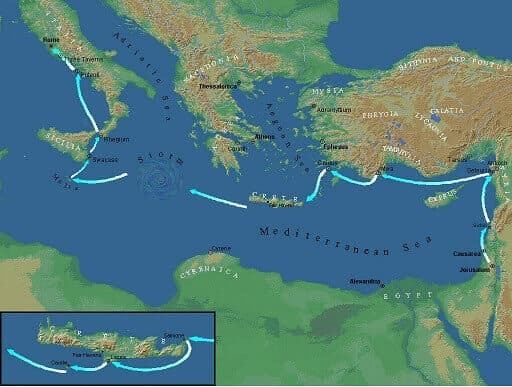 (12) And because the harbor was not suitable for wintering, the majority reached a decision to put out to sea from there, if somehow they could reach Phoenix, a harbor of Crete, facing southwest and northwest, and spend the winter there. Luke does not say exactly how much time was spent in Fair Havens waiting for the weather to clear, only that it was considerable. The fast (Day of Atonement) had come and gone and so had the summer weather. The time of year is now late October to November. God revealed to Paul that if they set sail, the voyage will be disastrous and that they would lose the cargo, the ship, and their lives. Paul tried to warn and advise Julius the Centurion and the crew that they needed to stay in Fair Havens or they would surely lose everything and everyone if they sailed. A conflict arose because of this advice. Some people agreed with Paul, that they should stay put. Many people disagreed with Paul and thought that they should move on. If the Centurion had heeded Paul's warning his authority would have been enough to keep the ship from sailing. But he vacillated, and leaned more toward the experience and advice of the pilot and captain. Finally, in true democratic style, the men took a vote; do we stay or sail? The majority vote was to sail. They did agree however not to make the journey to Italy. They would sail around the corner of Crete to the port of Phoenix, where they would spend the winter. It would only take them a day to sail to Phoenix in good weather. Their original problem still existed however, the weather was not being agreeable. Paul must have shook his head in resignation as everyone prepared to set sail. When you think about what the crew wanted to do, it is actually quite reasonable. Phoenix was a large town that was close to Fair Havens (see map). It was the preferred port in that it was better protected from the weather. Since Phoenix was a bigger town, there would be more to do, more entertainment, and probably better beer (I know it's hard to believe, but many sailors live to get drunk) while they waited. Their reasons for wanting to leave were actually valid, but there was a problem; God wanted them to stay. The parallel in our own lives is staggering. Sometimes (quite often actually) God says NO to us. It is not always because what we ask for, or what we want to do is unreasonable or bad for us. It may be because the journey to get there is too hazardous. God often tells us to wait because the weather outside is not right for the journey. I don't think that there was a bubble of fair weather sitting on top of Fair Havens. The crew of the ship knew what the weather was like, yet they decided to sail anyway. We have a tendency to be the same way, we hear God's voice warning us to wait, and decide that we know better. We set our sails and steer straight into the storms of life. Have you ever done that? Have you ever gone against the will of God and wondered why life suddenly got so rough? I know I have. Sometimes I wonder if I'll ever learn to truly trust God. Maybe you have the same problem. Sometimes we go through in life what Paul's shipmates are about to go through in the storm. (13) And when a moderate south wind came up, supposing that they had gained their purpose, they weighed anchor and began sailing along Crete, close inshore. (15) and when the ship was caught in it, and could not face the wind, we gave way to it, and let ourselves be driven along. (16) And running under the shelter of a small island called Clauda we were scarcely able to get the ship's boat under control. (17) And after they had hoisted it up, they used supporting cables in undergirding the ship; and fearing that they might run aground on the shallows of Syrtis; they let down the sea anchor, and so let themselves be driven along. The weather broke and a soft wind blew gently from the south. It was exactly what the crew had been waiting for. Thinking that the bad weather was behind them, they did not wait a few days to see if the good weather would remain. They wasted no time and quickly pulled up the anchor and raised the sails. They left Fair Havens and sailed close to the shoreline heading west for Phoenix trusting that their good luck would hold. Without any warning the violent winds of Euraquilo (the Mediterranean version of a northeaster) soon changed their luck. The crew fought to keep the ship on course, but the unexpected winds were too strong for the crew to manage. They had no choice but to give up and let the winds take the ship away from Crete. The door of fair weather had slammed shut in their faces. They passed underneath a small island called Clauda which only slightly diminished the wind. Taking advantage of this, the crew worked feverishly to secure the ship's lifeboat as they were tossed about by the waves. The crew and passengers were in for the ride of their lives. Fearing that the ship might break apart, they passed ropes underneath the ship and tied them together. To accomplish this task, several crewmen would take a long rope up to the bow of the ship where they would loop it over, and then walk it back to the stern where they would lash in place. They would tie dozens of the these ropes around the ship from the stern all the way up to the bow. The theory was that these ropes would hold the ship together. They would repeat this process until the boat had a “cocoon” around it. Personally, I have my doubts that this would work, but it does show us that the crew was very afraid. Passing ropes underneath the ship would not have been easy even in calm weather, and now they had to do it in heavy seas. As the bow rose and fell with the waves, they would be drenched from the spray of the sea as the bow crashed through the waves. When they were finished, they tied the sea anchor to the stern of the ship and tossed it into the water. The sea anchor would drag in the water behind the ship (like a small parachute) acting like a brake to slow the ship's momentum. The sea anchor would drift with the current and the boat would not be driven by the wind. The sail's had been lowered and the sea anchor set, all they could do now was hold on as the storm and the current drove them in a westerly direction. Having been in several storms at sea, I can sympathize with the crew of this ship. I remember one patrol on my first Coast Guard Cutter where we ran into a storm in the Gulf of Alaska. The wind and waves were against us as we headed north. Our engines were turning the propellers fast enough to move us sixteen nautical miles an hour, but the weather was actually pushing us backwards at two nautical miles an hour. The waves had risen to fifty feet and the ship was starting to take damage. One particularly large wave (as if they all weren't) struck the ship destroying one small boat in its cradle, blew out a hatch and porthole, and our ship started taking on water. The Captain turned the ship around and we let the storm drive us southward until the storm moved inland to Canada. I had an advantage over Paul however; the hull of my ship was made out of steel, his was made out of wood. (19) and on the third day they threw the ship's tackle overboard with their own hands. (20) And since neither sun nor stars appeared for many days, and no small storm was assailing us, from then on all hope of our being saved was gradually abandoned. Luke describes the ship (and passengers) as being “violently storm tossed.” Allow me to expound on what that means. Because the ship had a sea anchor dragging behind it, the waves would be moving faster than the ship. The stern of the ship would rise up steeply as a wave moved underneath them, and then the bow would pitch upward (and the stern would start to drop down) as the wave moved forward. In addition, as the ship was rising up and then falling, the wind would be rocking it from side to side, all simultaneously. Can you say seasick? Can you imagine trying to sleep in those conditions? Can you imagine trying to eat in those conditions? Can you imagine having any hope in those conditions? The wind was extremely strong, the waves were higher than the boat, and the crew thought the boat would be swamped. The Captain knew that he had to lighten the ship to prevent it from taking on water (and sinking) and he must have agonized over the decision to jettison his valuable cargo. The loss of his cargo would be the loss of all of his profits. Not only would he make no money, but he would be unable to pay the crew. They tossed the cargo (and their dreams of becoming rich) overboard and hoped for the best. Three days into the storm they realized that the ship was still sitting too heavy in the waves. Tossing the cargo overboard had not been enough; they had to find even more weight to go over the side. Luke notes that the crew threw the ship's tackle overboard with their own hands. This shows the seriousness of the decision. Without the tackle, the crew would have no way to easily raise and lower the sails. The water logged ropes and lines, blocks and pulleys all went overboard in a last ditch effort to lighten the ship even more. Anything that was not immediately needed was thrown overboard. This would also have included any weapons for defense that the ship may have been carrying. As the storm drove the ship westward, it also drove the hope out of their hearts and depression set in. The darkness of the storm hid the sun during the day. It hid the moon and the stars at night. It covered the men's hearts with a dark, thick blanket of hopelessness. Day dragged into weary day as time itself seemed to slow down. The ship was tossed by the waves and rocked by the gale force wind. Hungry, wet, cold, and seasick, the men hung on and waited to die. Any hope of coming out of the raging storm alive was gone. Have you ever been through a storm in life where you lost all hope? Did you feel like the situation or struggle that you were going through was going to sink your boat? Did you lose all hope that you would be rescued? If you have then you know what these men were going through. Sometimes there is no difference between a storm at sea and a storm in your life. Sometimes we can't see the light at the end of the tunnel. Sometimes the waves are looming high over our heads. Lightning cracks open the sky with blinding intensity, and thunder detonates with a loud resonating resound. The wind howls and the sea roars in its fury. We are caught in a storm without any hope and we wonder where God is. (21) And when they had gone a long time without food, then Paul stood up in their midst and said, “Men, you ought to have followed my advice and not to have set sail from Crete, and incurred this damage and loss. (22) “And yet now I urge you to keep up your courage, for there shall be no loss of life among you, but only of the ship. (25) “Therefore, keep up your courage, men, for I believe God, that it will turn out exactly as I have been told. If only I had listened to God. If only I had obeyed. Have you ever found yourself making those statements? Have you ever found yourself in a storm because you did not listen to or obey God's voice? Did you do something God told you not to do? Did you go someplace God told you not to go? That is what happened to the crew of Paul's boat. Because they did not listen, they lost all their cargo and profits. Because they did not listen, they lost the ability to sail the ship. Because they did not listen, they were now in the middle of a raging storm in the middle of nowhere. If only. Even though Paul knew the outcome of the voyage would be disastrous and that they were all going to die, he still prayed. Even though he knew the outcome of setting sail from Fair Havens would be the loss of everything, he still trusted in God. God answered Paul's prayers in an interesting way; the crew of the ship would lose everything except their lives. That may not have been the answer that Paul was looking for, but it was an answer and it was good enough. To Paul the answer was good news so he tried to cheer up the crew. Many times when we are in a storm we feel that we are all alone. We think that because we went against the will of God that He is not watching over us. This is simply not true. God is always waiting for us to reach out to Him, and pray. When God answers our prayer, it is usually not in a way that we expect. Because we are in the storm due to our disobedience, God uses it to teach us a lesson. The important thing is that we learn the lesson, and obey. Sometimes we lose everything except our lives. That is not necessarily a bad thing. When you have nothing, you have to depend on God. God wants us to depend on Him, even when you have everything. Please keep in mind that not all of the storms in life that we go through are caused by disobedience to God. Many times we go through a storm when we obey God because the devil is trying to discourage us. Many times God uses storms even when we are obedient to strengthen us and bring us closer to Him. Storms happen and in fact they are inevitable. The type of storm I'm referring to is the one brought on when we deliberately go against God's will. (27) But when the fourteenth night had come, as we were being driven about in the Adriatic Sea, about midnight the sailors began to surmise that they were approaching some land. (28) And they took soundings, and found it to be twenty fathoms; and a little farther on they took another sounding and found it to be fifteen fathoms. (29) And fearing that we might run aground somewhere on the rocks, they cast four anchors from the stern and wished for daybreak. (32) Then the soldiers cut away the ropes of the ship's boat, and let it fall away. It was the fourteenth night when the sailors realized that they were close to land. Over the sound of the wind and the waves, they probably thought they heard the sound of waves crashing on a distant shore. They threw over the sounding line and it dropped down to the twenty fathom mark. A sounding line is long piece of rope with a weight tied to the end, and various colored strips of cloth tied every six feet. In case you are curious, there are six feet in a fathom. Twenty fathoms is therefore, one hundred and twenty (120) feet. They hauled in the line, waited a while, and then took another sounding. This time the sounding line only dropped down to the fifteen fathom mark (90 feet). The sailors knew that they were getting close to shore. Fear and panic set in as the sailors realized that they were quickly being driven into what was probably a reef or rocky shore. They attached four anchors to the stern and tossed them overboard, hoping that this would stop the ship from being dashed to pieces on the rocks. Darkness prevented anyone from seeing just how close to land they actually were. The roar of the wind and waves prevented them from being able to accurately guage the distance to the shore they knew was getting close. They knew they were close to land, but they did not know how close. Some of the sailors panicked and decided to abandon ship using the lifeboat. They thought up an excuse so that no one would know what they were doing, and told their shipmates that they were going to set anchors from the bow. They fooled everyone except Paul. Paul realized what the sailors were doing and notified the Centurion that if anyone left the ship, everyone would die. The Centurion, who now wisely listened to Paul's advice, ordered his soldiers to prevent the escape by cutting the lines and throwing the lifeboat overboard. The soldiers cut the ropes to the lifeboat and watched it disappear beneath the waves. I imagine that the disgruntled sailors were not very pleased with either Paul or the soldiers. They had no idea that Paul was actually saving their lives. We have a tendency to be just like those sailors. We think we see an easy way out of a situation so we try to take it. We don't even care about how those actions will affect others around us. That is one reason why the suicide rate is so high; it's an easy way out. Alcohol and drugs are another easy way out. Instead of dealing with your problems, you hide in a bottle or inside a pill. But the easy way out was not God's way out. God wanted the men to stay on the ship until it crashed against the shore. Paul may or may not have known God's reasoning, what is important is that he chose to obey. So should we. If we see any easy way out but God does not give us permission to go that way; don't. God has never yet stopped the earth from spinning just so I could step off. That would not allow God to shape my character, and I'm not sure where I would go anyway. (33) And until the day was about to dawn, Paul was encouraging them all to take some food, saying, “Today is the fourteenth day that you have been constantly watching and going without eating, having taken nothing. (35) And having said this, he took bread and gave thanks to God in the presence of all; and he broke it and began to eat. (36) And all of them were encouraged, and they themselves also took food. (37) And all of us in the ship were two hundred and seventy six persons. (38) And when they had eaten enough, they began to lighten the ship by throwing out the wheat into the sea. Isn't it interesting how God takes care of us even when we are about to shipwreck? God was concerned that the men had not eaten in fourteen days so He had Paul encourage them. God knew that the men would need their strength in the upcoming ordeal so He convinced them (through Paul) to eat. He does the same thing with us also. He tries to keep our eyes on Himself and tells us that we will live through the storm. Even if the storm is of our own making, He still cares for us and He cares about us. After the men had eaten they threw the rest of the food overboard. About the only thing that was left on that ship were two hundred and seventy six persons. They were tired, cold, wet, and more than ready for daybreak. Even though Paul is a prisoner, he is clearly in charge. By now everyone has conceded that Paul has authority and they listen to him. When Paul tells them that God has spoken; they listen. When Paul tells them that no one will die; they cheer up. They follow his example and eat. The people of this world watch us also. They may not know it, but they long to hear from God. God uses us to speak to them. Paul set the example of Christ-like behavior that got everyone's attention. What do people see when they look at me? What do they hear when I talk? What do they read when I write? What do people see when they look at you? What do they hear when you talk? Do they see and hear someone whose hope is in the Lord? (39) And when day came, they could not recognize the land; but they did observe a certain bay with a beach, and they resolved to drive the ship onto it if they could. (40) And casting off the anchors, they left them in the sea while at the same time they were loosening the ropes of the rudders, and hoisting the foresail to the wind, they were heading for the beach. (41) But striking a reef where two seas met, they ran the vessel aground; and the prow stuck fast and remained immovable, but the stern began to be broken up by the force of the waves. (44) and the rest should follow, some on planks, and others on various things from the ship. And thus it happened that they all were brought safely to land. Daylight came at last and the men were able to see the land that was in front of them. No one onboard was able to recognize the island, although they would later find out that it was named Malta (see map). They saw a bay with a beach that would be perfect to land on. If they could just get into the bay and land on the beach, everyone, including the boat, would be safe. They cut the lines to the anchors and ship surged forward. The line that had been tied around the ship's wheel was untied so that they could once again steer the ship. The foresail was raised (quite a trick without lines and pulleys) and the ship headed for the bay. If the water had been calm, the sailors would have seen the reef. Unfortunately the waves hid the reef until the ship crashed down on top of it. The bow of the ship ground across the reef and stuck fast with a jolt that probably knocked everyone off their feet. The waves beat relentlessly against the stern of the ship and the constant pounding tore it to pieces. As the ship started to break apart, and everyone crowded to the front, the soldiers realized they had another problem; it was possible that their prisoners could escape. The Roman soldiers would be held accountable if any prisoner escaped. The soldiers had a very simple plan to prevent their prisoners from escaping; kill them. The centurion however wanted Paul to remain alive so he gave the order that no one was to be killed. The centurion then ordered all those who knew how to swim to jump overboard and head for land. Everyone else would have to find a plank or barrel or anything that floated and hang on and let the waves take them to the shore. In the end, everyone gathered together on the beach and found out that Paul was right; everyone was alive. Would you like to know a secret about Paul? It's not really a secret, but rather it's a little known fact. Here it is; Paul was never a prisoner of Rome. Did you know that? Not even the Roman soldiers knew that fact. But Paul knew it very well. Here are his own words. “Paul, a prisoner of Christ Jesus…” (Philemon v.1) That's wonderful Steve, but why do I care about that, and what does that have to do with anything? I am so glad you asked. If Paul is a prisoner of Rome, who is in control of Paul's life? The answer is Rome. If Paul is a prisoner of Christ Jesus, who is in control of Paul's life? The answer is Jesus! Now here is the point of this. Who are you a prisoner of? Fate? Your peers? Your bad decisions? Alcohol? Drugs? Jesus? Who is in control of your life? Think about it. Have you ever been shipwrecked? Perhaps not literally, but maybe you have been figuratively shipwrecked. Have you ever found yourself holding onto the debris of what is left of your life while the waves push you to the shore? Has your life ever crashed on a reef and had the waves smash it to pieces? Have you ever dragged yourself up onto the beach and thanked God that you somehow survived? I have been on that beach. You may have seen my face along with other survivors. I know what it is like to have been disobedient and have to sail through a storm of my own making. When my life shipwrecked, there was very little debris left to hang on to as I washed up on the shore. I rested on the beach for several years before I resumed my journey. As I look back at that wild ride through the storm and the subsequent crash on the reef of life, I learned something that I want to pass on to you. The first lesson is the obvious one, obedience. This is something that I can't stress enough, that we must be obedient to God. When He gives us something easy to do, we must obey. When He gives us something difficult to do, we must obey. When He gives something we do not want to do, we must obey. Even when we do not feel like it, we must obey. Obeying is something that we sometimes have to force ourselves to do. Obedience comes with practice. I have noticed that God has a tendency to send many practice sessions my way. Perhaps you have noticed the same thing in your life. We live in a “me first” civilization. It is a fast food society. We want everything right now (yesterday if possible). We want to have it our way, and we want to do it our way. We don't even like to be under the authority of someone else. Do you see why it is so hard for us to obey? Society bombards us daily (hourly if you watch a lot of TV) with suggestions to go against authority. To follow God and obey Him goes against what our flesh wants to do. This is why we must read our Bibles and spend time in prayer, because this is how we train ourselves to hear God's voice. Then we must train ourselves to follow His leading. The more that we learn to obey God, the less we want to disobey Him. The second lesson is that we cannot live in the regrets of the past, or in the dread of the future. Paul's shipmates made a very bad decision that put him in a dangerous predicament. Other people (your parents for example) may have made decisions that may have had a negative impact on your live. If you are married and have kids, you may have done things that have negatively impacted your children. It was not Paul's fault that he was in the storm riding on a doomed ship. He had no control over that decision. He did have control over his reaction to it. Paul chose not to live in the regret of the past. He could have said “woe is me, I'm a victim of my past,” and waited to die in the storm. He knew that the result of the decision to set sail would be the loss of the ship, cargo, and everyone's lives. He had every right to sit in a corner and moan with the rest of the seasick passengers. Paul also chose not to live in the dread of the future. Knowing that the ship was going to crash or sink and that everyone was going to die as a result could have put him in deep depression. It could have caused him to live in fear, wondering if the next wave was going to be the one that would sink the ship. The actions that caused him to be in the present situation were in the past and there was nothing that he could do about it. Or was there? Paul chose to pray and intercede for the lives of the people on that ship. I don't think that Paul was concerned about his own life, but rather I think he was concerned about the lives of everyone else on the ship. When the angel came and delivered the answer to Paul's prayer, he said that God had granted him the lives of all those who were sailing with him. Paul had spent his time interceding for the men on the ship. Instead of living in the regrets of the past, Paul prayed in the present, Instead of living in the dread of the future, Paul asked God to change it. It is all a matter of where our eyes are focused. Keeping our eyes set on the past is like trying to drive a car while only looking in the rear view mirror. You will not get very far before you crash. You may know people who are living their lives like this. They don't really know what is going on today, because all that is important to them is yesterday. Living in the dread of the future will turn you a paranoid being who lives in fear of what may happen. Either way, we are totally useless in the here and now. Prayer was the key that Paul used to lock the door of the past and unlock the door of the future. Paul knew that God was in complete control. Paul prayed and prayed and then prayed some more. He prayed until God answered his prayers. So should you and so should I. I don't know about you, but I don't spend enough time in prayer. Do you? Paul also interceded for the very people who were responsible for his present circumstances. Could I do that? Can you? These are questions that will affect, and, have an effect on our very lives. The third lesson is not quite as obvious but is just as important. It concerns the cargo we carry in our hold. The first thing the captain threw overboard in the storm was his cargo. By doing this, he prevented his ship from being sunk by the large waves. We have to do the same thing with our own lives. We carry in our personal cargo hold many things that we think have value and worth. I am not talking about the physical possessions that can weight us down (although they do) but rather the intangible things that make you who you are. Things like education, expertise, family background, where you grew up, or anything that you may put your confidence in. Paul said in Philippians 3:3-7 (v.3) for we are the true circumcision, who worship in the Spirit of God and glory in Christ Jesus and put no confidence in the flesh, (v.4) although I myself might have confidence even in the flesh. If anyone else has a mind to put confidence in the flesh, I far more: (v.5) circumcised the eighth day, of the nation of Israel, of the tribe of Benjamin, a Hebrew of Hebrews; as to the law, a Pharisee; (v.6) as to zeal, a persecutor of the church; as to the righteousness which is in the Law, found blameless. (v.7) But whatever things were gain to me, those things I have counted as loss for the sake of Christ. There were things in Paul's life that he counted as gain to himself. That means that those things were profitable to him and got him ahead in life. Like the cargo in the hold of the ship, Paul's background was worth its weight in gold. What is interesting is that Paul counted it not as gain, or profitable to himself, but as loss for the sake of Christ Jesus. What does that mean? The word that Paul used for loss is the same word that Luke used when he described the loss of the cargo when ship's crew threw it overboard. It is the Greek word “zemia” which means to suffer loss by casting away. The loss comes from your own actions. It is something deliberate that you do. Just as the crew of the ship deliberately threw the cargo overboard, we have to deliberately throw overboard those things in our life that would sink our boat. Some of those things that we need to get rid of are pride, arrogance, and self-righteousness. It might be a good idea if we went down into our personal cargo hold and took a close, prayerful inventory. You might be amazed at what you find in there. If you ask for guidance, the Holy Spirit will show you those things in your life that you need to throw over the side. Do not wait for a storm, do it now. We carry around an awful lot of excess baggage and junk that we pick up as we travel through life. Things that happened to us in our past, adds weight to our journey. People that we come in contact with hand us burdens that add even more weight to our ship. The crew of the ship found after tossing the cargo overboard that they had to get rid of the tackle also. So do you. You can't control your past, but you can (in a sense) control the future, by controlling how you react to the past. Did you know that God has already provided us with a bolt cutter that will cut through the chains of the past? Chains that weigh us down and hinder our forward movement can be removed. That set of bolt cutters has a name. Its name is forgiveness. Forgiving others who have wronged and hurt you, and forgiving yourself (which can sometimes be even more difficult) cuts away chains that you have been carrying for years. I know that this may sound like one of those quaint answers that doesn't really help (we have all heard them from well meaning friends who don't have a clue). But take this from someone who has been there. I know from experience that it can take much time to get to the point where you can forgive someone or even yourself. But God was patient with me and He will be patient with you. It took the owner/captain of the ship three days after jettisoning the cargo before he threw the ship's tackle overboard. Did it really take him three days to figure out that the ship was still too heavy? I don't think so. Three days in a bad storm is a long time. I know this because I have been through bad storms out at sea. Why did it take him three days to throw the tackle overboard? I have a theory, and it applies to our lives. The tackle was part of the ship. They literally had to unhook or unfasten the tackle to remove it. Your past hurts are a part of you. That is why forgiveness can take a long time. You have to consciously, and prayerfully take a look at the tackle in your life and make the decision to unhook and throw it overboard. The problem is that it is not easy to do this. The good news is that God really does want to help you. He is waiting to show you the thing (or things) in your life that you do not need to be carrying on the voyage. Once He shows you those things, He will help you throw them over the side. If it takes time for you to do this, God will not condemn you. He is patient and will give you the strength that you need. Do not be discouraged, it took me three years to forgive someone who had hurt and wronged me. Three years! It also took that much time for me to able forgive myself for allowing, not putting a stop to, and perhaps even encouraging the situation. God did however get me to the point where I could forgive, and I did. The chains fell off and I felt my life become lighter. I know that God can help you because He helped me. I made it through the storm. So did Paul. So can you. Paul was not alone on the ship; there were other passengers onboard also. His friend Luke (who later wrote about the adventure) and some other personal friends, who were seeing him to Rome, were right there beside Paul the entire trip. You are not alone either. There are many others who are going through the storm and who have gone through the storm. Never be afraid to reach out to your fellow passengers. God uses storms to teach us how to help others who are going through (and those who will go through) storms. Even though God told Paul that the ship, cargo, and all lives would be lost, Paul still prayed. God answered Paul's prayers and spared the lives of everyone onboard. No matter how bleak your situation may be, continue to pray. Just as God took care of Paul, He will take care of you. He will see you through the storm because He cares about you and He cares for you. May God bless you keep you safe as you go through the storms of life. May He guide you down the path of life according to His will. May you come into a deeper relationship with the Lord and a deeper understanding of His ways. May you come to obey God in all situations. May He fill you with His love, and teach you to love Him the way that He wants you to love Him. May He keep you from sin, and show you the escape route out of temptation. May you have fair winds and following seas as you sail through life.